The stomach produces a strong acid to help digest food and protect against microbes. To protect the tissues of the body from this acid, it also secretes a thick layer of mucus. If the mucus layer is worn away and stops functioning effectively, the acid can damage the stomach tissue, causing an ulcer. An estimated one in every ten people in Western countries will have an ulcer in the stomach or small intestine at some point in their lives. Stomach ulcers are relatively easy to cure, but they can cause significant problems if left untreated. 1. The most common causes are bacteria and use of nonsteroidal anti-inflammatory drugs (NSAIDs). 2. The classic symptom of a stomach ulcer is indigestion. 3. Treatment for stomach ulcers normally focuses on removing the cause. A woman is lying down with abdominal pain. Pain is the main symptom of a stomach ulcer, either around the stomach or slightly higher up. The classic symptom of a stomach ulcer is indigestion, also called dyspepsia. Indigestion causes pain or discomfort in the stomach area. This symptom can be mistaken for heartburn, which can occur at the same time. Heartburn can be caused by acid reflux or gastroesophageal reflux disease (GERD). It occurs slightly higher up from the stomach and is felt in the lower part of the chest. It is worth noting that not all stomach ulcers cause indigestion. Stomach ulcer symptoms tend to be more distinct than heartburn, but symptoms can still be vague. An ulcer tends to produce a burning or dull pain in the stomach area. This pain is sometimes described as a "biting" or "gnawing" pain. Some people may describe a hungry sensation. Some stomach ulcers go unnoticed and show no typical indigestion-type pains. These ulcers are less common and tend to be diagnosed after the ulcer has started bleeding. Some ulcers can cause a hole in the stomach wall. This is known as perforation and is a serious condition. Stomach ulcer symptoms often change over time and can be difficult to spot. Dietary changes can help prevent stomach ulcers from developing. 1. Fruits and vegetables: Eating a variety of fruits and vegetables is key to a healthy digestive tract lining. These foods are rich in antioxidants, inhibit acid secretion, and contain cytoprotective and anti-inflammatory properties. A 2017 study advises that these are all important factors for preventing and treating ulcers. 2. Fiber: Diets high in soluble dietary fiber reduce the risk of developing stomach ulcers. 3. Probiotics: Food that contains active bacterial content, such as probiotic yogurt, can help to reduce a Helicobacter pylori (H. pylori) infection. Probiotics have been shown to slightly improve symptoms of indigestion and the side effects of antibiotics. 4. Vitamin C: This powerful antioxidant may be effective in helping to eradicate H. pylori, especially when taken in small doses over an extended period. Fruits, legumes, and vegetables, such as oranges and tomatoes, contain high levels of vitamin C.
5. Zinc: This micronutrient is important for maintaining a healthy immune system and healing wounds. Oysters, spinach, and beef contain high levels of zinc. 6. Selenium: This may reduce the risk of infection complications and may also promote healing. Brazil nuts, yellowfin tuna, and halibut are recommended for their high selenium content. 7. Avoiding alcohol and caffeine can also help reduce the risk, as they both cause the body to produce more gastric acid. This can lead to stomach ulcers. It is important to use dietary options (SUPPLEMENTS) to support a treatment plan for the most effective outcome, as opposed to relying only on diet. 1. A class of painkillers known as NSAIDs can increase the risk of stomach ulcers: The two best-known NSAIDs are aspirin and ibuprofen.The risk of ulcers increases if the drugs are taken in high doses, or regularly for a long time. 3. Excess stomach acidity, or hyperacidity: This can occur for a range of reasons, including genetics, smoking, stress, and some foods. 4. Zollinger-Ellison syndrome: This is a rare disease that causes an excess of stomach acid to be produced. Certain behaviors and factors increase the chances of developing a stomach ulcer. Stomach ulcers are more common in individuals over 50 years of age. People can develop a stomach ulcer at any age, but they are much less common in children. The risk in children is higher if their parents smoke. People should always check labels and talk to a pharmacist or a doctor about any concerns with using painkillers. They may recommend an alternative such as acetaminophen. Stomach ulcers are one type of peptic ulcers. There are two other types: Esophageal and duodenal ulcers. Esophageal ulcers form inside the esophagus, and duodenal ulcers occur in the uppermost part of the small intestine, known as the duodenum. The ulcers share similar characteristics but are identified by their location in the body. Once the cause has been removed, the symptoms of stomach ulcers can be treated by protecting the ulcer from acid while it heals. In certain cases, surgery may be an option. 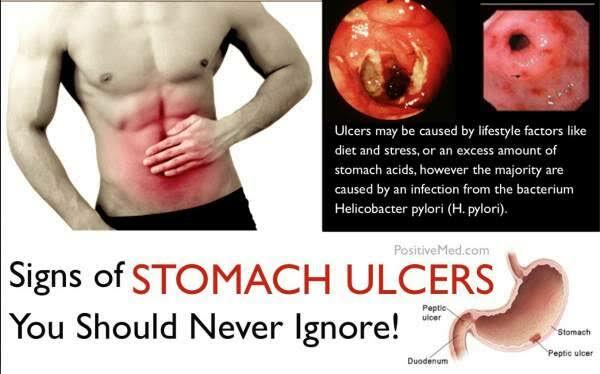 For instance, if the ulcer continues to return, will not heal, bleeds, or prevents food from leaving the stomach. Stomach ulcers are often treated by removing the cause of the problem. Doctors follow the symptoms of a stomach ulcer by asking questions about how the pain feels, where and when it happens, and how frequent and long-lasting it has been. This process helps to narrow down whether there is a stomach ulcer or not. Your doctor may also ask for a stool test or a breath test to find out whether the stomach ulcer is from H. pylori bacteria. Endoscopy: A camera is inserted at the end of a long, thin, flexible tube to look at the gut lining. A biopsy may also be taken. Barium enema: This is a thick liquid that allows X-rays to be taken of the gut. Anyone who thinks they may have an ulcer in their stomach should consult their doctor. Any stomach symptoms that last for more than a few days or keep happening need evaluation and treatment. The supplements are thought to work in a number of ways including reducing the inflammation caused by an excessive build-up of Helicobacter pylori, increasing capillary resistance to these bacteria and increasing exposure to proven antioxidants that can eliminate free radicals in the system and improve the overall health of the sufferer. Moringa is proven to help heal gastric ulcers which are a painful and debilitating digestive system disorder. Although lemon juice is very acidic, small amounts mixed with water can have an alkalizing effect when it’s digested. This can help neutralize the acid in your stomach. If you decide to try this home remedy, you should mix one tablespoon of fresh lemon juice with eight ounces of water. Then drink it about 20 minutes before a meal to help prevent symptoms that might be triggered by food. Be sure to drink this mixture through a straw, if possible. This can prevent the acid in the juice from touching your teeth and eroding tooth enamel. And you should never drink straight lemon juice due to its acidity. It needs to be diluted with water to be effective. Drinking lemon in water can also help to remove other metabolic and acidic wastes from the body. It will also help to alkalize the body and control the proliferation of unhealthy bacteria and viruses. The worst is to drink the lemon directly in its raw state. What a nice post. Keep it up!